The behemoth you see before you is the Terlingua – Angus Beef, Chile Con Carne, Corn Fritos, Tillamook Cheddar, Sassy Sauce – or to put it simply…a cheeseburger with Frito pie on top. But “Terlingua” really is a lot more fun to say. As the waitress delivered his burger, all my friend could say was, “Whoa” partly out of fear and partly out of sheer delight at the prospect of consuming this burger. He later stated that he had probably lost a week of his life for such an indulgence. But he was okay with that since the burger was so enjoyable. My friend washed down his burger and fries with an ice cold bottle of Shiner Bock. Let me tell ya…there was no drop in quality or flavor from my first burger to this one. It was amazing to see each burger coming out of the kitchen looking absolutely immaculate. Just like on my previous visit, the meat was seasoned and cooked perfectly. Even with the addition of bacon, the burger wasn’t overly salty. 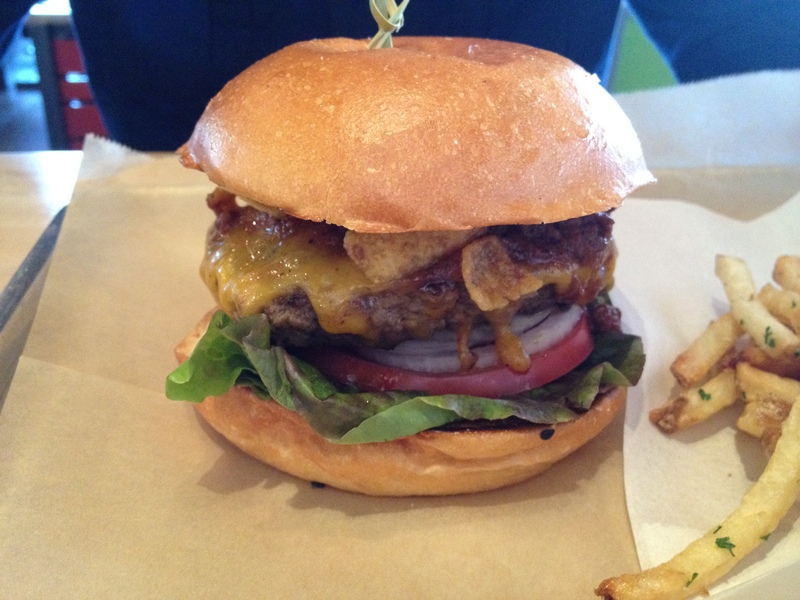 Actually, the bacon added a subtle smoky saltiness that complemented the rest of the burger. The hatch chiles, chipotle mayo, and pepper jack cheese added a nice heat, but again did not overpower. Everything, to my palate, worked harmoniously. However, as was the case last time, my bottom bun nearly didn’t make it to the end. 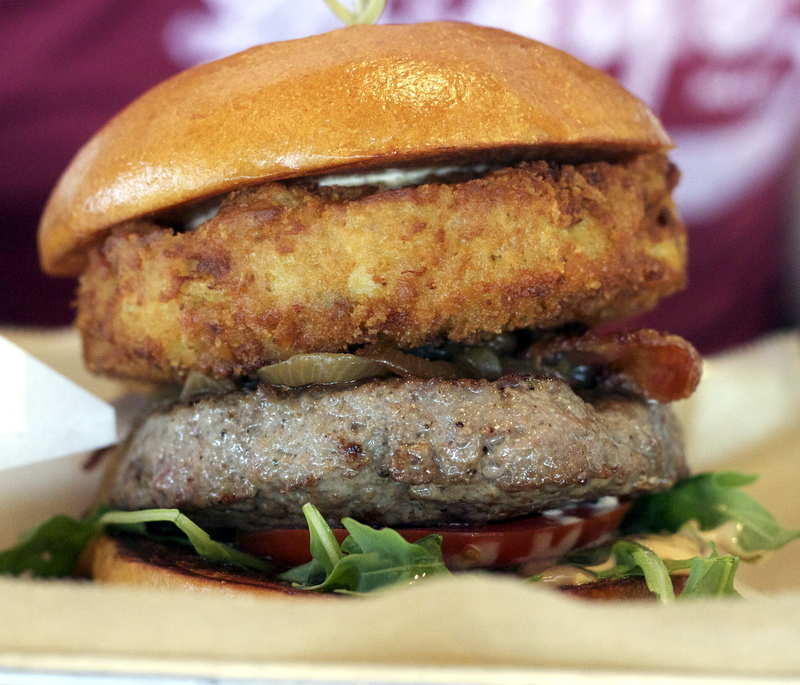 Affectionately called the Hatcheroni (aka, Hatch Mac), this burger is just nuts. In addition to the deep-fried patty of goodness and Angus beef, the burger comes dressed with arugula, tomato, caramelized onion, apple-smoked bacon, and chipotle aioli. I should’ve known that I was in trouble when the waiter asked me if he could get me something to smush down the burger with. I tried to press it down with my hand, but that thing did not want to budge. I got the sweats after eating this burger. You know…when you’ve eaten more than you should have? I’m not a fan of arugula, but with its peppery flavor, it was the perfect green veg for this rich burger. The bottom bun had no chance of survival. I had to finish off the Hatcheroni with a fork because everything just fell apart. I mention this bottom bun issue because sometimes it can be a big hassle if a burger’s too messy to eat. I enjoyed the experience, but halfway through the burger my mouth got tired from its overwhelming height and I kinda forgot I was eating a burger. With everything getting mushed together, it reminded me more of a casserole. 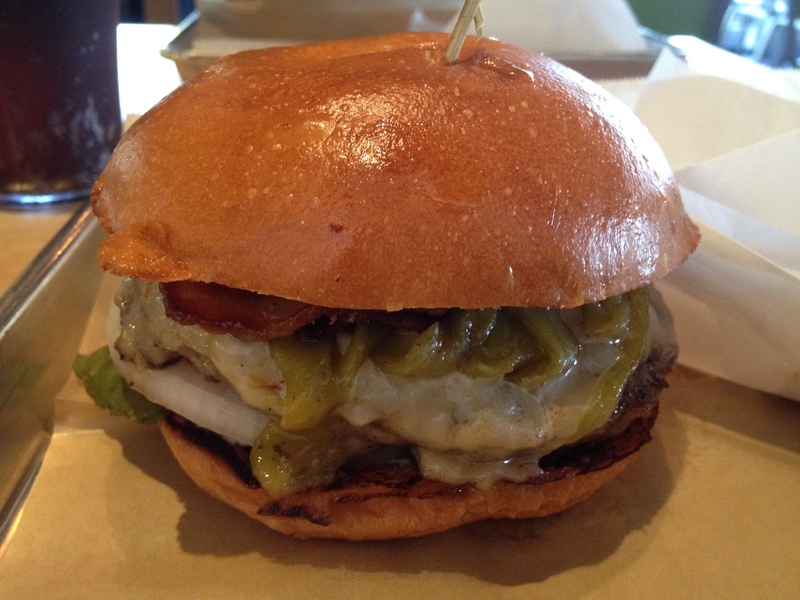 Although it was quite the visual spectacle, I would have to say that this was my least favorite of the Hopdoddy burgers I’ve tried so far. Would I eat this burger again? Yes, but this is definitely a once-a-year burger. For now I think I’ll stick with burgers that don’t exceed 6 inches in height ;). You’re welcome any time :). I think you would love their burgers! !